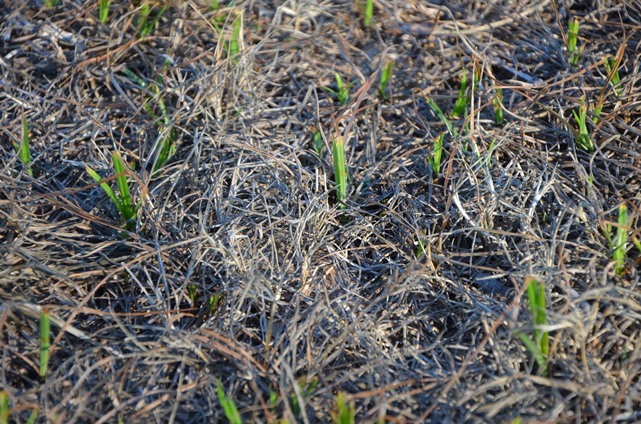 Photo caption: Purple nut sedge is dormant, but quite alive and waiting for warm weather. The best hope for control is to use a pre-emergent herbicide in late February to early March which will prevent this exotic invasive plant from germinating. Now that March is here the lawn becomes less of an abstraction and more reality. The lawnmower is no longer silent, meaninglessly taking up space as the grass wakens from its seasonal stupor. Alas, the dormant state has ended as the days are already getting slightly longer. There is still time to get started with preparations for the ideal spring lawn of 2017. Weather is getting warmer, there is plenty to do. In addition to doing a soil test, mentioned in previous week’s articles, an accurate weed assessment is also necessary. Though not green and conquering new territory, some of the weeds remain with seed still attached and awaiting distribution. If the seed are still on the plants, clip the seed pods or remove the plants with the seed intact. Dispose of these properly and do not give them a chance to spread and germinate. Two notable culprits are nondescript lying dormant waiting for the return of warm, sunny weather. Purple nut sedge and chamberbitter still have countless nutlets and seeds connected to the parent plant. Purple nut sedge, Cyperus rotundus, grows from every possible sunny location with soil. This non-native plant is a rapidly spreading perennial which will take every opportunity to colonize new locations. The identifier purple is in its name because there is a purple-tinged section of this sedge where it emerges from the ground. The plant is sometimes referred to as purple nut grass because of its long narrow leaves and its erect growth pattern originating from a nutlike basal bulb. Chamberbitter, Phyllantus urinaria, is an annual with produces great quantities of seed on the underside of its leaf stems. It will handle full sun or partial shade and quickly form cluster of plants, each contribution seed to the soil. Areas in the lawn identified as having severe infestations should be marked now for treatment in the near future with a pre-emergent herbicide. This type of herbicide prevents the seed from germinating in the spring. Purple nut sedge concentrations should be sprayed in late February to early March, and chamberbitter in April since these pest species germinate at different times. Another winter task is to prepare for seeding bare spots in the lawn. Reading the seed tag attached to the bag should help make the product selection much easier. Check to confirm the seed has been tested for germination within the year. Also, be sure the grass seed species will grow in Florida. 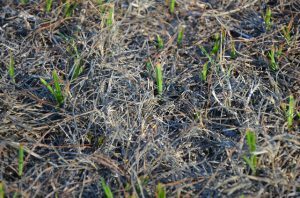 Sometime generic lawn seed mixes will contain fescue, bluegrass, orchard grass and others turf types which will not grow in north Florida. While they may germinate, their use will only ensure weeds get established for another year. Lastly, sharpen the lawnmower blade. When the warm weather arrives the mower will be frequently used, but at least the neighbors will be envious of the great green lawn. To learn more about lawn grasses, contact your UF/IFAS Extension Office.